HowMechanismWorks ? 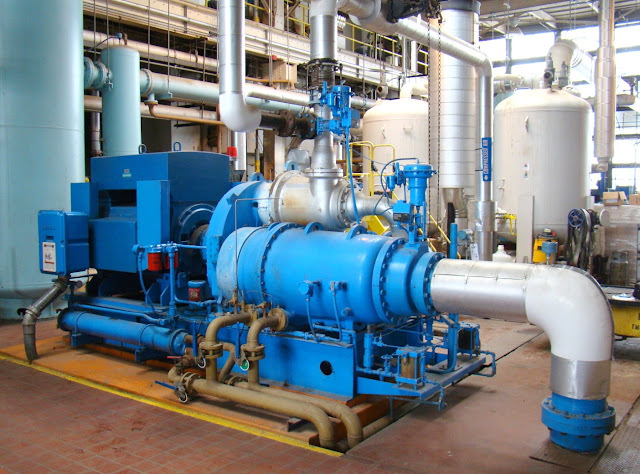 : How Does a Centrifugal Compressors Works ? How Does a Centrifugal Compressors Works ? Centrifugal Compressor is a device which are designed to produce large volumes of compressed gas or vapor by a radial acceleration by an impeller in an extremely energy efficient process with the help of a surrounding case.It can then be arranged multistage for greater proportions of compression. The compression is largely influenced by a centrifugal pump. Centrifugal compressor was invented during the times of Second World War. They are used in gas turbine units. It is usually a radial flow roto dynamic fluid machine which mostly works with air as a working fluid medium. It utilizes all the pressure imparted to the machine from outside to increase the internal energy of the fluid. But soon after the war, they realized axial compressors give appreciably high isentropic efficiency. Centrifugal compressors is the reborn interest in the Centrifugal stage. 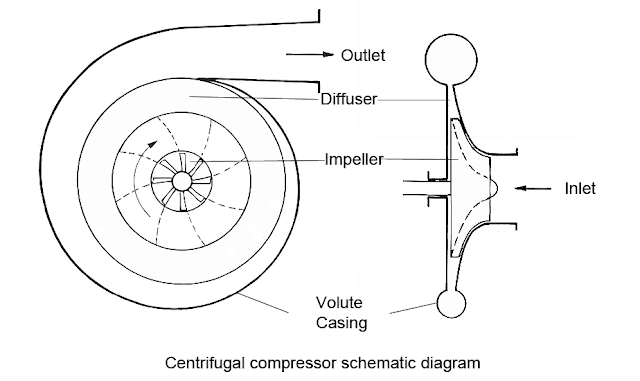 To understand that How Does a Centrifugal Compressor Works ? First We should know about the Major Parts of Centrifugal compressor and its Purpose. The above mentioned components are usually protected or guarded by a casing or housing . A case house consists of number of bearings in order to provide radial and axial support of the rotor. The impellers is the rotating part of the pump which is assembled or mounted on a steel shaft and this assembly and also known as compressor rotor (mostly in multi stage compressors). The rotor provide velocity to the gas with blades that are attached to a rotating disc. It is rotated by the motor and consists of series of backward curved blades. The impeller extracts the gas with great velocity into a diffuser passage. The diffuser usually compromise two walls which form a radial channel. Because of these arrangements the velocity of the gas decreases and dynamic pressure is converted into static pressure. The diffuser passages are small space between adjacent diaphragms which generally turns the gas flow 180° in order to direct it towards the next impeller. Following the last stage impeller the gas must be collected and delivered to the discharge flange. The component used to collect the gas discharged through the diffuser is called as collector. It may also be termed as volute or scroll. The collector may also contain valves and other instrumentation in order to control the compressor. When the air is drawn into the center of a rotating impeller with radial blades and is pushed toward the center by centrifugal force. This radial movement of air results in a pressure rise and the generation of kinetic energy. Before the air is enters into the center of the impeller, the kinetic energy is also converted into pressure by passing through a diffuser and volute.The diffuser is actually a fixed or static component that escorts the air flow when it leaves the impeller. This loss in velocity eventually results in an additional increase of pressure. The impeller and the diffuser contributes about 65% and 35% of the total pressure developed or produced in the compressor. Each stage takes up a part of the overall pressure rise of the compressor unit. Depending on the pressure required for the application, a number of stages can be arranged in a series to achieve a higher pressure. This type of multi-stage application is often used in the oil and gas and process industries. Alternately, in wastewater treatment plants, low pressure, single-stage applications are used to achieve the desired pressure ratio. In modern configurations of centrifugal air compressors, ultra-high speed electric motors are used to drive the impellers. This results in a compact compressor without a gearbox and associated oil-lubrication system, thus making it oil-free and appropriate for applications that require 100 percent oil-free air. 1.Very unstable when the flow is reduced. 5.Periodic replacement is necessary for proper functioning.